We’re 10 games into the season and, what, four games into this run game renaissance. A lot of time has transpired, a lot of things have changed and a lot of items have been shown and seen. West Virginia was in its rarest form Saturday in Kansas, not merely because the day produced a 49-0 final score, the first conference shutout since 2005, the first year with two shutouts since 1996 and the first time since 1969 three players had 100 yards. The Mountaineers were doing and showing things they hadn’t really done or shown much if at all before. There were new ideas, there were old things with new appearances and there were old ideas done in new ways. I think we’ve seen this particular formation now and then and not much more than that. But I think it’s always been a draw. This was not a draw, which is what the defense just has to expect. And it wasn’t a power play, which would probably be second in line in the minds of the Jayhawks. It’s a zone play to the left, and Skyler Howard’s legs have essentially moved defenders to the opposite of the play — what I mean is that since he can run the ball, there’s no need for a running back in the backfield, and that running back can go right and take a safety with him. It quite nearly worked, too. Pause it at :02. Cody Clay widens out. That lets left tackle Marquis Lucas combine with left guard Stone Underwood to handle the defensive end, and Clay and Lucas create an alley. If Howard goes to that space, he’s 1-on-1 with the safety. Plays like this are supposed to create 1-on-1s, and though Howard might not win that confrontation, he also might win it. Howard instead cuts it inside, no doubt because he really trusts center Tyler Orlosky, who has had better snaps than this one. Uh, Mike, what’s so rare about this? Why lead with one play and just a minor alteration? Get your own blog! Good question! This was only one leaf on the branches the offense has been and is sprouting. Surely by now you know WVU runs power plays in gap schemes, which is a fancy way of saying when the offense gets away from zone blocking and goes between the tackles, it likes to have the offensive linemen on the side of the play seal off the defense inside and climb up to the linebackers if possible while a guard guard pulls from the back side of the play to clear the way. Last week against Texas, we saw a wrinkle. Here’s a power play that includes fullback Elijah Wellman. That’s actually a counter play. It’s a power play with the offensive linemen on the play side sealing and climbing and the added fullback assuming the role of the pulling guard, who now takes on the outside linebacker or defensive end while the fullback clears a path. The Mountaineers again had this rolling against Kansas, and it was really fun to watch. But … but there was no Wellman there. That was Wendell Smallwood playing the role of fullback and blocking the linebacker, and how often has WVU used Rushel Shell and Smallwood together this season? Not often, right? As it was, WVU barely used Wellman with another running back on these counters. Wellman was actually used most on the counters with Cody Clay and another running back in the diamond, and it was new and startling. No contest. Untouched through the middle. The right guard gets the outside defender. Clay (bottom of the screen) gets a second-level defender and Wellman clears a linebacker from Shell’s pathway. Did I say it was startling? Shell scored not one, but two touchdowns on the play. WVU didn’t abandon the ordinary power runs, either, and Smallwood scored one of his two touchdowns on the play — actually no, he didn’t, because Wendell Smallwood, but he pushed in on the next play. But watch those last two runs. They’re similar and different and effective. Knockout punches, man. The counters are new, and the Mountaineers spent a few weeks working on this in practice before they ever brought it out of the garage. The success is in the deception, though. The Mountaineers are doing something new by showing something familiar. “It looks like we’re going to go outside zone, but then we take a counter step and come back with a guard pulling the other way and another back leading the way to pick up anything extra,” said Wendell Smallwood, WVU’s first running back in eight seasons to have four straight 100-yard games. WVU’s in a four-receiver set, which we know is not common this season, and this ends up being a counter without any sort of assistance from the fullback. It might be a trap that uses the pulling guard to seal off the side the run goes to. I don’t know. I do know WVU kept doing it — left side! — because it worked, and if you know Holgorsen, you know that if it works, he’ll do it again. We’d not seen many of these things, but now we’re to a point where a single aspect — pulling guards — worked and spawned a handful of new plays that feature that single aspect in wholly different ways. That’s next-level stuff taking this rebooted offense to the next level. How did we get here? 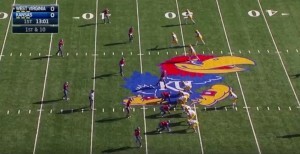 Let’s find out by taking a look at the Good and the Bad of WVU v. Kansas. Use it. You know you will. Just to be clear, he’s not all right. Not physically, at least. He can play, but he could use some time off, too. But he had himself a game. Remember the spectacular play against Maryland? His forced fumble on the second play for Kansas ought to rekindle some memories. He makes a play when it’s someone else’s job to make that play, and sneaking up on a foe steals a possession his offense maximizes. Two Kansas plays later, Chestnut’s interception return put points on the board, and it came right after the Jayhawks ran a similar route and Chestnut remembered, “Wait, they like to run hooks into the boundary. I dare them to do it again, because I’ll jump it and house it.” That happened. But neither is the play I want to show you. The one above is it. He again helps out and gets the defense off the field, but he goes shoulder first into the play to make the tackle when he knows and we know he’s one knock away from maybe missing the rest of the season. I asked Tony Gibson Monday if Chestnut was a guy who can play hurt and play well because he knows the trade and the tricks, because he studies and applies his preparation. That’s not incorrect. Gibson then referred to our above play, an “ordinary” play he nevertheless needed to see. WVU shut out Kansas, and I heard and read some, “Right, but it’s Kansas,” and I don’t get that. What more could the defense have done? The Jayhawks had one first down in the first half, thanks to a WVU penalty, and zero third down conversions. They were never a threat. The Mountaineers just didn’t allow it, taking control and creating no way for the Jayhawks to escape the grasp. (Side bad: Worst intentional grounding ever?) If it’s a non-threatening team, that’s pretty much all you can expect a defense to do, and then the second- and third-teamers got into the game. WVU played, like, a half with reserves either in spots or in droves. Thirty players — every player who traveled and plays defense — got in on the action, and guys like Nana Kyeremeh and Rasul Douglas are getting their first career interceptions on passes at and into the end zone. True, Kansas came into the game with a very bad offense, but Kansas was allowed only to have only a very bad offense Saturday. It’s sort of surreal to me that people are qualifying shutouts, as though the Mountaineers are supposed to go out and do these things. The numbers were impressive and what you hope to see against an overmatched opponent with a flawed strategy to stop anything. (Side Bad: The Kansas safeties. Willie Nelson thinks they were high far too often … except here, when one creeps up and can’t make the play. The Jayhawks really missed a Fish named Smithson.) The offensive line was never under siege and was always under control. The backs all ran hard. The skill position blocking was as good as it’s been all season, and that’s no doubt the byproduct of practicing running as much as the Mountaineers have. Most importantly, Smallwood ended a week spent answering silly questions about whether or not he can score touchdowns by scoring two touchdowns, and this one was a silencer. It wasn’t just the defense emptying its bench. The offense played a bunch of backups for a bunch of the game, including on the offensive line, and did not score. That wasn’t exactly encouraging. It’s not like WVU changed the game plan and started to run the ball to get out of Lawrence, and William Crest’s extended action left a lot to be desired. All of that said, it was fun to see Ricky Rogers make this play on the heels of the other very cool, very favorable headlines he’s been making. The poor offensive line. WVU would snap the ball 51 times in the first half and run on many of them. It’s 42-0 here and an honest day’s work is honestly done. But Holgorsen calls a screen, and needless to say the big guys have been more invested. Seventeen in a game, and 12 by Kansas. That’s the third-highest total ever against the Mountaineers and the most since the last time these two played. But poor Matt Wyman. He’s the third Kansas punter this season. He got the job in the sixth game and has punted 48 times already. That’s more than 27 teams! He fought that wind, too. It was 22 mph at kickoff, and he had punts of 34, 35, 36, 37 and 47 yards in the second quarter and then 35 and 42 yards in the third quarter. Seven punts and a 38 yard average. He was throwing rocks on a pond, and I admired him. His other four punts with the wind averaged 44.2 yards, including a 50-yarder. Nick O’Toole was great for WVU, too. He averaged 52 yards on five punts. Three were into the wind, and he got away with 45-, 57- and 44-yarders into the wind. But seriously, that was his best game in conference play, right? You have to consider the overall product, which includes his running and trusts that a lot of what you see is the product of him switching and changing things. He carried nine times for 129 yards and a touchdown. He completed 13 of 22 passes for 133 yards and a touchdown. WVU, which couldn’t score 30 not long ago, has 31, 38 and 49 in the past three games (with defensive touchdowns in the past two). We’ll point and laugh at this throw and the two times he overshot Shelton Gibson and Jovon Durante, but that wind was real. You’ve got to allow for some level of understanding for someone who doesn’t have any track record of playing in those conditions or a terribly strong arm. So “take away” those three passes and remember he threw away one pass on the run. He’s not 13-for-18 against Kansas, but he did the passing part better than 13-for-22, and we haven’t discussed two other throws. I thought this was a weird play live because I always think WVU runs this (kind of) play and keeps the receivers on the opposite side of the field far from the throw. That way, you know, a cornerback on the right side can’t come off his receiver and blow up a touchdown pass at the goal line. But that’s what happens. Derrick Neal is the cornerback at the bottom of the screen, and you can see his receiver goes deep. But watch it again. The slot receiver, Daikiel Shorts, goes wide and a defensive back spins over to cover him. Stop it at :05. Durante is at the 12-yard line. The defender who starts the play across the slot covers Durante when his route enters the defender’s neighborhood. Neal is a safety with nothing to do but look for trouble. It’s a good decision and a good throw by Howard. It’s a better play by the defense. I put zero blame on Gibson, either. He does drop passes, but he got dropped here. There’s Neal again, and he manages his shortcomings by using his left arm to smack Gibson’s left arm. Gibson high-points this, and he’s supposed to turn and fall, but the bobble turns his attention from a proper landing to securing the ball. He did catch a pass for the first time in three weeks, but he’s not making the plays he was making before. But new things are happening all the time for Gibson. “I got overthrown for the first time and I got hit hard for the first time,” the sophomore from Cleveland said. This felt like a game he could have carried the ball twice as often as he did, but he didn’t call his number often. When he did, it generally worked. This is a read play, we have to assume, and he’s got his eyes on that outside defender before the snap. He knows that guy’s coming, and it’s in Howard’s head that the defender will overdo it and leave the left side open. That’s easy, and don’t look now, but Gibson’s done a better-than-normal job blocking the past two weeks. This isn’t exemplary, but it’s an example. Now, near as we could tell, Howard wasn’t perfect. But it didn’t often matter. (Aside: Memorial Stadium is a dive, but the high camera locations were useful for me and for this.) Stop it at :03. If he gives it to Shell, then Shell has Gibson on the sideline against the cornerback and then Shorts in the slot and Smallwood on the go to lead a convoy against two other defenders. Even if Smallwood is a sub-stellar blocker, Shell’s moving with blockers and, as you can see, a ton of space. Kansas heads to its right on the snap, too. It’s open. Howard sees something we don’t and keeps it — or it’s also again entirely possible this is for him all the way — but he realizes early he’s in a bad spot. Marcell Lazard, the right tackle, doesn’t get the second-level defender he’s supposed to get. Even if the pulling left guard Stone Underwood (Side Good: Him.) gets his block, Lazard’s defender is going to end this. But Howard, to his credit, spots all of that, quickly heads right and reroutes to follow Shell, who is now a blocker because he doesn’t have the handoff. Underwood’s pull makes me think this run was for Howard all the way. But this next one was definitely his call, and it was a fun little callback. We’ve seen this play and we’ve seen Howard chuck it up the rail more than once, but Howard saw easy yardage, which was needed on second-and-13. You want to credit him for not testing the wind, but the wind punched him in the nose on the interception moments later. Now, Kansas and its young and poor defense made things easy, as you could probably tell without the need for 2,500 words. 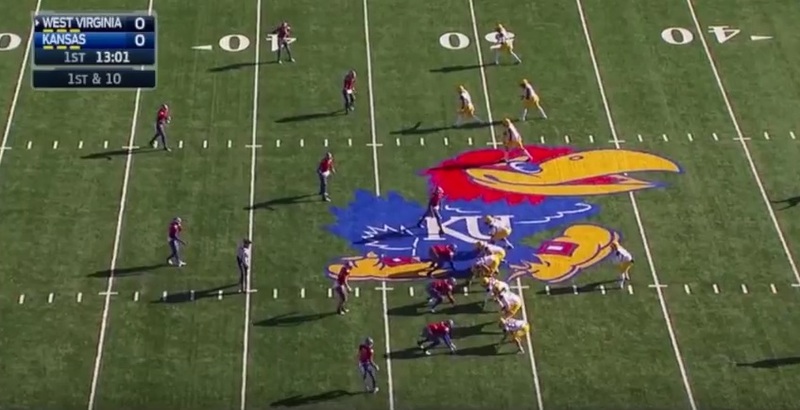 The Jayhawks don’t blitz much, but when they did, it wasn’t very effective. Like, the defender on the left hash on the second level? What’s the purpose? It’s 4-on-5 when Kansas drops a defensive lineman, and WVU wasn’t going to lose those battles Saturday. Jordan Thompson cruises across the middle, and Howard calmly makes an accurate-enough throw. This next one was one of Howard’s best plays, and it’s what Holgorsen talks about when he references the intermediate passing game. It’s third down, and I’m going to assume WVU had a very good idea what to expect from what’s likely a very limited third down package for Kansas. Howard’s changing things and moving Smallwood, who then motions right, which discombobulates the defense. The zone floats over his way, Howard looks left to keep the linebacker on the 49 where he stands. Thompson starts from the right, finds some grass in the middle of the field behind the defenders floating the other way and below the safeties. Howard, who stayed in the middle on the period play in the absence of pressure, gets a little warm here and shuffles left. He’s had lose mechanics when he’s shifted left or right this season, but this was pretty tight and kept WVU moving toward its final touchdown. Some very, very important people have been telling me about the first Thanksgiving, which took place at what is now one of my very classy and exclusive golf courses. Anyway, this chief Massasoit was not a very bright fellow, okay. Look. He sends this Squanto guy to help these pilgrims — plain people in drab clothing, very sad — learn to plant corn. Maize if it makes you feel better, losers. Can you believe it? I won’t say the pilgrims gave everybody smallpox, but next thing you know, everybody has smallpox. Now had it been me in charge of the tribe, of course the tribe would be Trump-branded. But besides that. Look, you put these people in a registry. I mean, they’re not even the same religion! At the very least, you kick them out and make them go back where they came from, or you build some casinos and a yooj wall in their path. Yooj. About this basketball team: I thought at half-time of the Cal/San Diego game that we could handle Cal better than the we could the Aztecs; plus Cal’s #14 ranking would have been a better win for us. We may be in for a real challenge tonight; Richmond was an outstanding competitor. Five double doubles in five games for Williams has to be turning some heads. That Richmond was supposed to be able to score leads me to believe holding them under 60 was a good sign. On the other hand, that we had so much trouble running offense reminded me too much of the last couple of years. Also, they seemed to handle the press pretty well in the second half. Hoping a good night’s sleep helps our guys overcome what looked like a little jet lag.